Beauty and the Beast (French: La Belle et la Bête) is a 1946 French romantic fantasy film adaptation of two French fairy tales. The first fairy tale, from which the film took both its title and most of its content, was written by Jeanne-Marie Le Prince de Beaumont and published in 1757 as part of a fairy tale-anthology (French: Le Magasin des Enfants, ou Dialogues entre une sage gouvernante et ses élèves, London 1757). From the second fairy tale, (French: La Chatte Blanche) by Marie-Catherine d'Aulnoy, published almost sixty years previously in one of the earliest fairy tale anthologies of France, (French: Les Contes des Fées, Paris 1697-1698), only a single but very evocative narrative motive was taken: servants, previously magically reduced to their arms and hands, with these still performing all servants' chores. While scrubbing the floor at home, Belle is interrupted by her brother's friend Avenant who tells her she deserves better and suggests they get married. Belle rejects Avenant, as she wishes to stay home and take care of her father. Belle's father arrives home announcing he has come into great fortune that he will pick up the next day, along with gifts for his daughters. Belle's brother Ludovic signs a contract from a moneylender allowing him to the ability to sue Ludovic's father if he can't pay up. Later, Belle's father finds on his arrival that his fortune has been seized to clear his debts and is forced to return home through the forest at night. Belle's father gets lost in the forest and finds himself at a large castle whose gates and doors magically open themselves. On entering the castle, he is guided by enchanted candelabra that lead him to a laden dinner table where he falls asleep. Awakened by a loud roar, Belle's father wanders the castle's grounds. He plucks a rose from a tree which makes the Beast (Marais) appear. The Beast threatens to kill him for theft but then suggests that one of his daughters can take his place. The Beast offers his horse Magnificent to guide him through the woods home. Belle's father explains the situation to his family and Avenant, as Belle agrees to go and take her father's place. Belle rides Magnificent to the castle, finding the Beast. Belle faints at the sight of him and is carried to her room in the castle. Belle wakes up and finds a magic mirror which allows her to see anything. The Beast invites Belle to dinner, where he tells her that she's in equal command to him and that she will be asked every day to marry him. Days pass as Belle grows more accustomed and fond of the Beast, but continues to refuse marriage. Using the magic mirror Belle finds her father deathly ill. The Beast grants her permission to leave for a week. He gives Belle two magical items: A glove that can transport her wherever she wishes and a golden key that unlocks Diana's Pavilion, the source of the Beast's true riches. Belle uses the glove to appear in her bedridden father's room, where her visit restores him to health. Belle finds her family living in poverty, having never recovered from Ludovic's deal with the moneylender. Jealous of Belle's rich life at the castle, her sisters Adelaide and Felicie steal her golden key and devise a plan to turn Ludovic and Avenant against the Beast. Avenant and Ludovic devise a plan of their own to kill the Beast, and agree to aid Belle's sisters. To stall Belle, her sisters trick her into staying past her seven day limit by pretending to cry. Belle reluctantly agrees to stay. The Beast sends Magnificent with the magic mirror to retrieve Belle but Ludovic and Avenant find Magnificent first, and ride him to the castle. Belle later finds the mirror which reveals the Beast's sorrowful face in its reflection. Belle realizes she is missing the golden key as the mirror breaks. Distraught, Belle returns to the castle using the magic glove and finds the Beast in the courtyard, near death from a broken heart. Meanwhile, Avenant and Ludovic stumble upon Diana's Pavilion. Thinking that their stolen key may trigger a trap, they scale the wall of the Pavilion. As the Beast dies in Belle's arms, Avenant breaks into the Pavilion through its glass roof and is shot with an arrow by an animated statue of the Roman goddess Diana and is himself turned into a Beast. As this happens, arising from where the Beast lay dead is Prince Ardent (Marais) who is cured from being the Beast. Prince Ardent and Belle embrace, then fly away to his kingdom where she will be his Queen, and where her father will stay with them and Belle's sisters will carry the train of her gown. 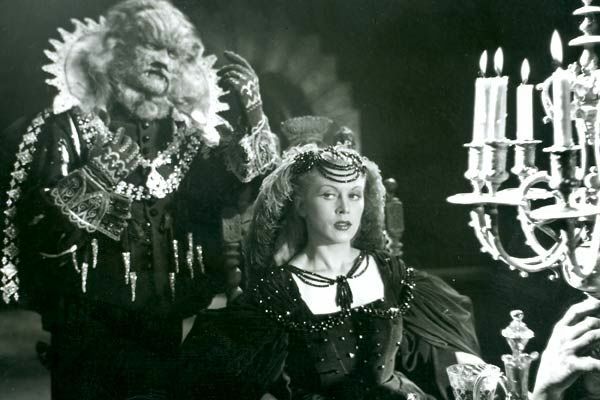 This film version of La Belle et la Bete adds a subplot involving Belle's suitor Avenant, who schemes along with Belle's brother and sisters to journey to Beast's castle to kill him and capture his riches while the sisters work to delay Belle's return to the castle. When Avenant enters the magic pavilion which is the source of Beast's power, he is struck by an arrow fired by a guardian statue of the Roman goddess Diana, which transforms Avenant into Beast as Belle declares her love for the Beast and reverses the original Beast's curse. When the Beast comes back to life and becomes human at the end, he transforms into a Prince Charming with Avenant's handsome features, but without his oafish personality. In the original tale, Belle has three brothers, whereas in the film, she only has one. Also in the original tale, Belle and her family are forced to move to a farmstead in the countryside after the loss of their fortune; in the film, they continue to live in their townhouse. Also in the original tale, the sisters are turned into statues as punishment for their cruelty, whereas in the film, they are merely forced to carry the train of Belle's gown at her wedding, though it is implied that they will now be her servants. Jean Marais originally suggested to Cocteau for the beast to have a stag's head, obviously remembering a detail in the fairy tale (French: La Chatte blanche): The knocker at the gate to the castle of the princess/The White Cat has the form of a roe's foot. While this suggestion followed the narrative lines of its fairy tale origin and would have evoked the mythical echo of Cernunnos, the celtic stag-headed god of the woods, Marais' idea was nonetheless refused by Cocteau who feared that in the eyes of modern cinema audiences a stag's head would turn the beast into a laughing-stock.